Apple released an update Monday to a favorite, though under-hailed, hunk of wireless networking hardware: the AirPort Express Base Station. The new version looks identical to its rectangular predecessor ( ) and boasts a single major improvement—802.11n networking versus the slower 802.11g standard found on the original AirPort Express—as well as a few minor tweaks. Streaming audio: With iTunes and an AirPort Express Base Station on your network you can stream audio tracks from within iTunes to play through an audio device attached to the Base Station’s audio jack. Although Apple doesn’t support streaming audio from other applications, Rogue Amoeba’s $25 Airfoil 3.1 ( ) makes this possible. Remote printing: Like the AirPort Extreme Base Station, you can string a USB cable between the appropriate ports on the Express Base Station and your printer and print remotely. This is a nice way to station a printer in a central location convenient for everyone in your home or office. Nothing has changed in this regard after Monday’s release. 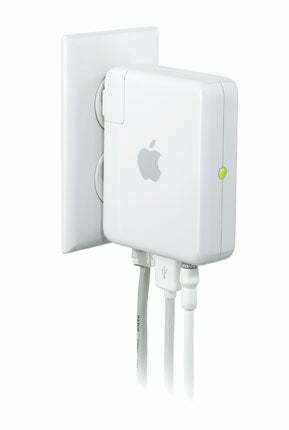 What the latest AirPort Express brings to the table is enhanced range and speed, as well as a few minor new features. Specifically, Apple claims that the new Express brings twice the range. If it offers the kind of extended range some of us have found from our n-flavored Airport Extreme Base Stations, this is definitely a good thing. Signals that used to peter out from a certain distance now offer the strongest possible signal across multiple floors. Similarly, a faster Express will certainly do no harm if you currently have today’s AirPort Extreme Base Station. And that base-station-in-hotel scenario should bring benefits as well. The new Express also adds support for a number of features the AirPort Extreme gained when it made the jump to 802.11n. For example, like the Extreme, the Express now also supports the older 802.11a standard. And through the use of the latest AirPort Utility, it offers the same easy-to-use setup procedure available to the AirPort Extreme and Time Capsule. The Express also gains the time-based network-access feature available to the 802.11n AirPort Extreme Base Station since its debut last year. This feature lets you limit the days and times at which each computer on your network can access the network. For example, you can limit a computer’s access to the network to workday hours. So, to sum up, other than the existence of the faster 802.11n networking and the trickling down of a few minor features from the latest AirPort Extreme Base Station, there’s not a lot to see here. Regardless, the AirPort Express was a good bet to begin with and adding greater range and speed hardly diminishes its advantages. We’ll be taking an official look at Apple’s latest wireless appliance soon.